The Niobrara Formation has proven to be very productive with the advancements in new drilling and completion technologies. Specifically the mufti-stage plug and perf method, along with the horizontal drilling of two mile laterals on 1280 acre spacing units seems to be producing the highest EUR (estimated ultimate recovery) wells. If you own mineral rights in the most perspective townships in Weld County, Colorado then it is likely that you have a producing well on your mineral rights. The most common issue we hear from our mineral owners in Weld County, Colorado is ” Those checks sure did start out nice, but after 6 months the royalty checks really dropped like a rock!” This is typical of Niobrara wells. The initial production from a Niobrara Well is very strong at first, but the rate of decline in the first 6 months is extreme. Many of the mineral owners that we work with in Weld County, Colorado enjoy the initial production from the Niobrara Well, but become disappointed with their royalty checks very quickly. This is where 1280 Royalties, LLC can help. We offer to purchase mineral rights in Weld County, Colorado in many of the different Townships. We like to tell our mineral owners that are looking to sell their mineral rights in Weld County to keep half and sell half of their mineral rights. This allows them to participate in any future wells that might be drilled, but also receive a lump some payment that will help with their current financial needs through a sale. What ever the reason is you are considering selling your mineral rights in Weld County, Colorado 1280 Royalties can assist you. Please contact us today to receive a bid: 303-832-1994. Colorado’s location in the U.S.
Weld County is the third most extensive and the ninth most populous of the 64 counties of the State of Colorado of the United States. The United States Census Bureau estimates that the county population was 252,825 in 2010 census, a 39.7% increase since 2000 census. 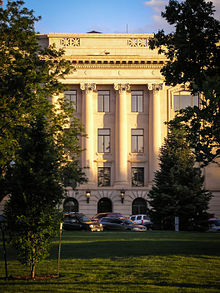 The United States Office of Management and Budget (OMB) has designated Weld County as the Greeley, CO Metropolitan Statistical Area, a component of the Denver-Aurora-Boulder, CO Combined Statistical Area. Weld County Courthouse from Lincoln Park. On May 30, 1854, the Kansas-Nebraska Act created the Nebraska Territory and the Kansas Territory, divided by the Parallel 40° North (Baseline Road or County Line Road or Weld County Road 2 in the future Weld County). Present-day Weld County, Colorado, lay in the southwestern portion of the Nebraska Territory, bordering the Kansas Territory. In July 1858, gold was discovered along the South Platte River in Arapahoe County, Kansas Territory. This discovery precipitated the Pike’s Peak Gold Rush. Many residents of the mining region felt disconnected from the remote territorial governments of Kansas and Nebraska, so they voted to form their own Territory of Jefferson on October 24, 1859. The following month, the Jefferson Territorial Legislature organized 12 counties for the new territory, including St. Vrain County. St. Vrain County was named in honor of Ceran de Hault de Lassus de St. Vrain, the French trader who established the first trading post on the upper South Platte River. St. Vrain County encompassed much of what is today Weld County. The Jefferson Territory never received federal sanction, but on February 28, 1861, U.S. President James Buchanan signed an act organizing the Territory of Colorado. On November 1, 1861, theColorado General Assembly organized 17 counties, including Weld County, for the new Colorado Territory. Weld County was named for Lewis Ledyard Weld, a lawyer and territorial secretary. He died while serving in the Union Army during the Civil War. Until February 9, 1887, Weld County’s boundaries included the area now comprising Weld County, Washington County, Logan County, Morgan County, Yuma County, Phillips County, and Sedgwick County. Weld County was thrust into the media spotlight on the evening of November 1, 1955, when United Airlines Flight 629, a Douglas DC-6B airliner flying from Denver to Portland, Oregon, exploded in midair and crashed, killing all 44 persons on board the plane and scattering bodies, wreckage and debris over a six-square-mile area of the county. The subsequent investigation of the accident revealed that Denver resident John Gilbert Graham had secretly placed a time bomb composed of 25 sticks of dynamite in a suitcase belonging to his mother, who was a passenger on the airplane. Graham was tried and convicted of the crime, and executed in 1957. In northeastern Weld County, Minuteman III missile silo “N-8”, one of the many unmanned silos there, was the target of symbolic vandalism by Catholic peace activists in 2002. Recently, conservative Weld County commissioners made national news when they began a campaign to secede from the State of Colorado, approving a ballot measure for November, 2013. The legality of this initiative has been questioned by local attorneys. Cropfields in western Weld County. Weld County lies within the relatively flat eastern portion of Colorado; the northeastern portions of the county contain the extensive Pawnee National Grassland and the Pawnee Buttes, which jut 250 feet (76 m) above the surrounding terrain. Along the western border some low hills betray the presence of the foothills of the Rocky Mountains further west. The county is served by two interstate highways: I-25 (US 87) runs through the southwestern corner and I-76 from the south central edge northeastward to the Morgan county border. Other major roads include US 85 and US 34, which intersect nearGreeley, and State Highway 14, which runs through Ault. According to the 2000 census, the county has a total area of 4,021.56 square miles (10,415.8 km2), of which 3,992.45 square miles (10,340.4 km2) (or 99.28%) is land and 29.11 square miles (75.4 km2) (or 0.72%) is water. Note: All figures for area and population given above were as of the 2000 census. The area has been reduced since November 15, 2001 with the creation of the new Broomfield County from part of Weld County and parts of Adams, Boulder, andJefferson counties. In the county the population was spread out with 28.20% under the age of 18, 13.20% from 18 to 24, 29.70% from 25 to 44, 20.00% from 45 to 64, and 9.00% who were 65 years of age or older. The median age was 31 years. For every 100 females there were 100.60 males. For every 100 females age 18 and over, there were 98.00 males. The median income for a household in the county was $42,321, and the median income for a family was $49,569. Males had a median income of $35,037 versus $25,757 for females. The per capita income for the county was $18,957. About 8.00% of families and 12.50% of the population were below the poverty line, including 14.60% of those under age 18 and 8.50% of those age 65 or over. A grain elevator in Nunn. Rock formation near the Pawnee Buttes. Sunrise over the Pawnee National Grassland in northeastern Weld County. Jump up^ United States Census Bureau. “2010 Census Data”. United States Census Bureau. Retrieved 5 February 2012. Jump up^ “OMB Bulletin No. 10-02: Update of Statistical Area Definitions and Guidance on Their Uses”. United States Office of Management and Budget. December 1, 2009. Retrieved April 19, 2012. Jump up^ See the Colorado census statistical areas. Jump up^ “An Act to provide a temporary Government for the Territory of Colorado” (PDF). Thirty-sixth United States Congress. 1861-02-28. Retrieved 2007-11-26. Jump up^ “Weld County, Colorado County Information”. ePodunk. Retrieved November 5, 2013. Jump up^ “Warren AFB Minuteman Missile Site Coordinates”. Asuwlink.uwyo.edu. Retrieved November 5, 2013. Jump up^ Romano, Analisa. “Greeley Attorneys Question Legality Of Weld Commissioners Advocating For 51st State”. The Greeley Tribune (via Huffington Post). Retrieved 11 October 2013. Jump up^ “Census 2000 U.S. Gazetteer Files: Counties”. United States Census. Retrieved 2011-02-13. Jump up^ “U.S. Decennial Census”. Census.gov. Retrieved July 16, 2013. Jump up^ “Annual Estimates of the Resident Population: April 1, 2010 to July 1, 2012”. Census.gov. Retrieved July 16, 2013. Jump up^ “Weld County: About Weld”. Co.weld.co.us. Retrieved November 5, 2013. This page was last modified on 7 November 2013 at 03:32.